It's hard to remember the last time I had a French bread pizza—it had to be while I was still in high school when boxes of Stouffer's pizza were not an uncommon item to find in our freezer. I guess once I left home, I also left behind French bread pizza altogether, and there really isn't a good reason for that because it's not like I didn't like this garlic bread and pizza amalgamation. When putting together a last minute Meatwave during an unseasonably warm Sunday this past December, I thought pizza would be something I could pull off on short notice, although pizza events always tend to a lot of work for me during the actual cookout due to the time and attention it takes to prepare pies with fresh dough. So I got to thinking how much easier it would be to swap dough for bread and, all of sudden, French bread pizza was back in my life! I started out my recipe for French bread pizzas with the sauce I've been using for a long time now. It's a very thick and rich tomato sauce, utilizing three cans of tomato sauce and a whole can of tomato paste that's simmered with garlic, crushed red pepper, oregano, and onion. After about twenty minutes of cooking, I remove the onion, stir in basil, and season with salt, pepper, and sugar to make what I think is one fine sauce for almost any pie. I took some cues on my process from Kenji's French bread pizza recipe, which has a garlic oil spread on the bread prior to cooking. In essence, this is just creating garlic bread, and I imagined this process would create the most flavorful French bread pizzas possible, so decided to go for it. I simmered garlic, oregano, and crushed red pepper in a mixture of extra-virgin olive oil and butter, giving the oil a robust garlicky taste. Once done cooking, I also stirred in a small handful of basil to up the herbal component of the oil. 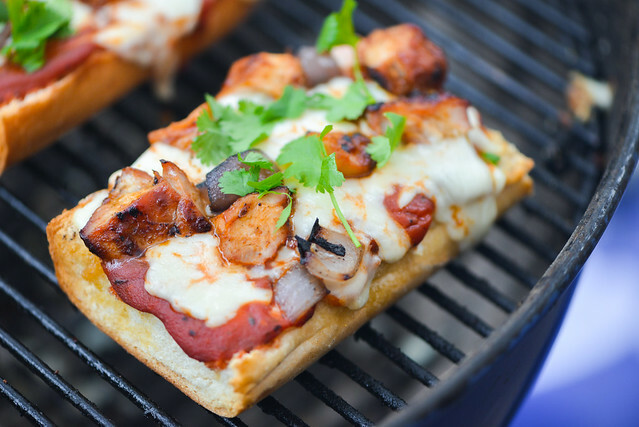 We topped our French bread pizzas in a number of different ways that day, but the one I decided to share on the blog is our barbecue chicken incarnation. It's a topping mixture I've successfully used in the past and it just seems apt for a barbecue blog to feature a barbecue pizza. 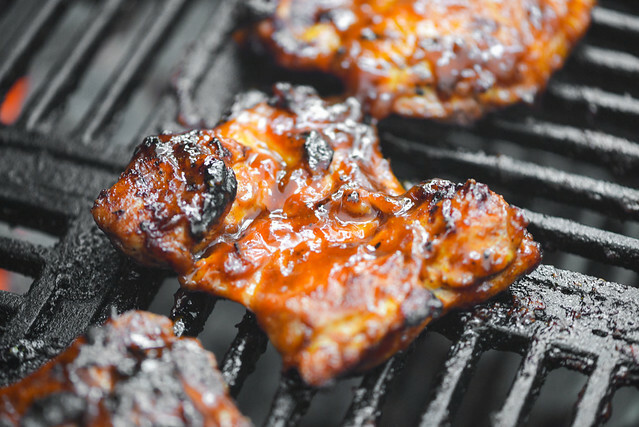 This does make the recipe a little lengthier though because it requires seasoning chicken thighs with a barbecue rub and then grilling them, while brushing on multiple layers of sauce during cooking, to get pieces of chicken that are fully loaded with barbecue flavor. I also like to grill and then chop up some red onions, which add another flavor and texture layer to the finished pizza and further enhance the grilled profile. 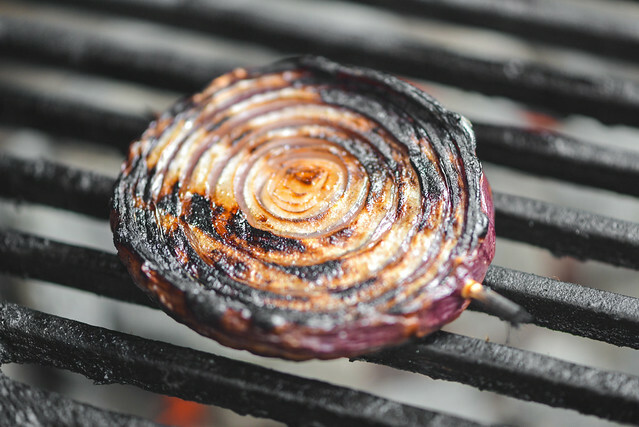 When grilling onions, it's best to cut thick slices and then skewer them horizontally, which keeps the rings intact and easy to manage on the grill. Once the chicken and onions were done and diced, I still had plenty of heat left in the fire to make the pizzas. I started these out using those squishy loaves of "French" bread you can find in most grocery stores. This isn't the place for high quality, already crusty bread, which would probably dry out too much during the long cooking process. I split each piece of bread lengthwise and then cut each of those into three equal pieces. After placing the slices on the cool side of a two-zone fire, I brushed on the garlic oil and lined the top of each slice with mozzarella cheese. I covered the grill and let the pizzas cook until the cheese had started to melt, but wasn't overly gooey yet—which took about five minutes. 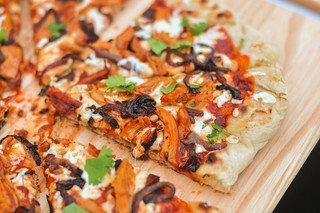 Next I spread on a layer of sauce and added all the toppings—another layer of mozzarella, barbecue chicken, and charred red onions. I covered the grill again and this time let the pizzas cook until the cheese was totally melted. When done, I gave each pizza a garnish of cilantro leaves and then served. I'm not quite sure why I let French bread pizzas stray from my diet—they are certainly easier to put together than a pizza with raw dough and they're incredibly satisfying. There was a pleasurable level of crackling crust that gave way to softer, warm, and buttery innards that melded well with the sauce and cheese. The barbecue chicken and onion were a great topping pair, adding a lot of complexity with sweetness, spice, tang, and crunch. You, of course, can top these any way you please, and I don't think there was a French bread pizza that came off the grill that day that wasn't loved. 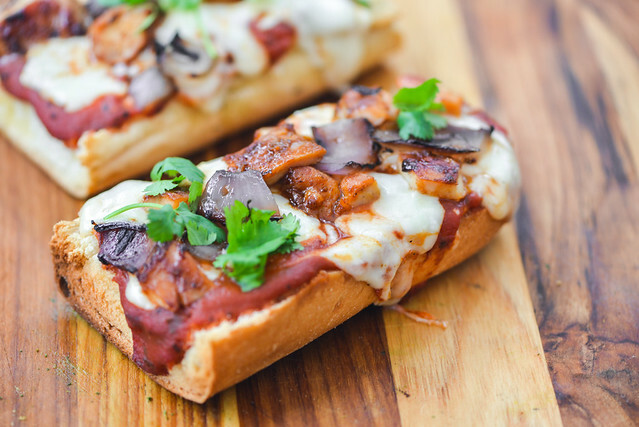 Crusty, buttery, and garlicky bread is topped with sauce, mozzarella, barbecue chicken, and charred onions to make a hearty and satisfying French bread pizza. To make the pizza sauce: Place olive oil, garlic, and crushed red pepper in a medium saucepan. Turn heat to medium. 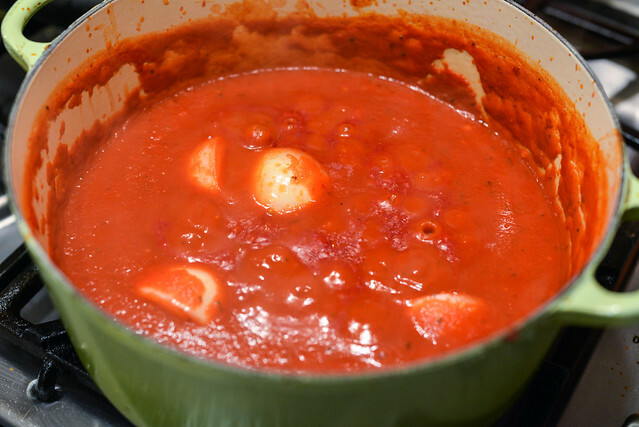 When bubbles begin forming around garlic, add in tomato sauce, tomato paste, onion, and oregano; stir to combine.Bring to simmer, then reduce heat to low and cook, stirring occasionally, until sauce thickens slightly, about 20 minutes. Stir basil and sugar. Season with additional sugar, salt, and pepper to taste. Set aside or transfer to an airtight container and place in refrigerator until ready to use. 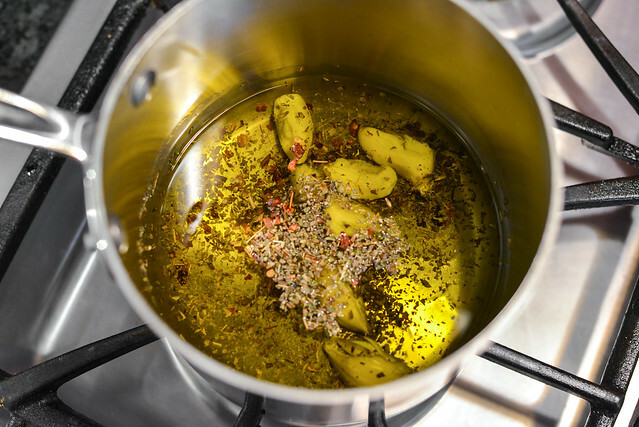 To make the garlic oil: Place olive oil, butter, garlic, oregano, and crushed red pepper in a small saucepan. Turn heat to medium. When bubbles begin forming around garlic. Turn heat to medium-low and continue to cook until garlic has softened, but not browned, about 2 minutes. Remove from heat and stir in basil. Set aside. To make the chicken: In a small bowl, mix together brown sugar, salt, paprika, chili powder, garlic powder, onion powder, and cayenne pepper. Coat chicken thighs all over with spice rub and set chicken aside. Light 1 chimney full of charcoal. When charcoal is lit and covered with gray ash, pour out and arrange coals on one side of the charcoal grate. Set cooking grate in place, cover grill, and allow to preheat for 5 minutes. Clean and oil the grilling grate. Place chicken thighs on cool side of grill, cover, and cook for 5 minutes. Brush chicken with barbecue sauce, flip, and cook for 5 minutes more. 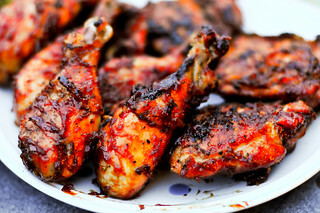 Brush chicken again with barbecue sauce, flip, cover grill, and cook until center of chicken registers 160°F when an instant-read thermometer is inserted into the thickest portion of the meat, about 5 minutes more. 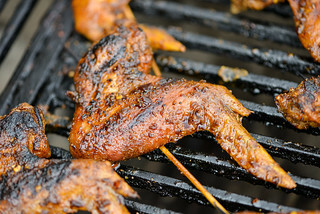 Brush chicken a third time with barbecue sauce and move to hot side of grill. Cook, flipping occasionally, until chicken develops light charring on both sides. Transfer chicken to a cutting board and let rest for 5 minutes. Roughly chop chicken. Place onion slices over hot side of grill and cook until softened and well charred on each side, about 5 minutes per side. Transfer onion slices to cutting board, remove skewers, and roughly chop. 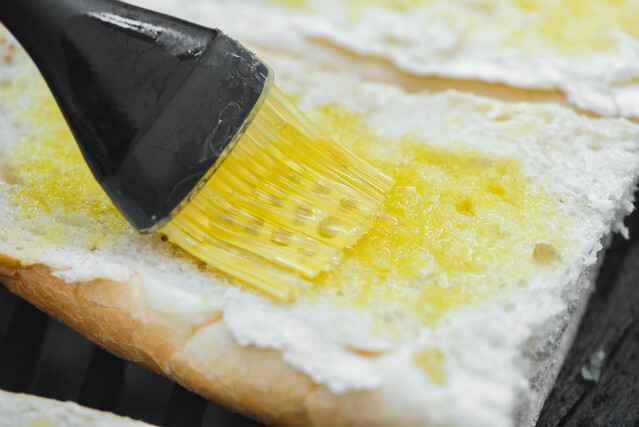 To make the pizza: Brush cut sides of bread with garlic oil and top with a layer of mozzarella. 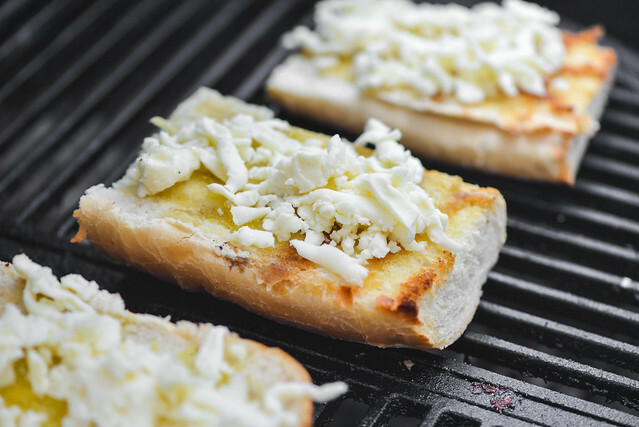 Place bread on cool side of grill, cover, and cook until cheese has begun to melt and bread is slightly crusty. 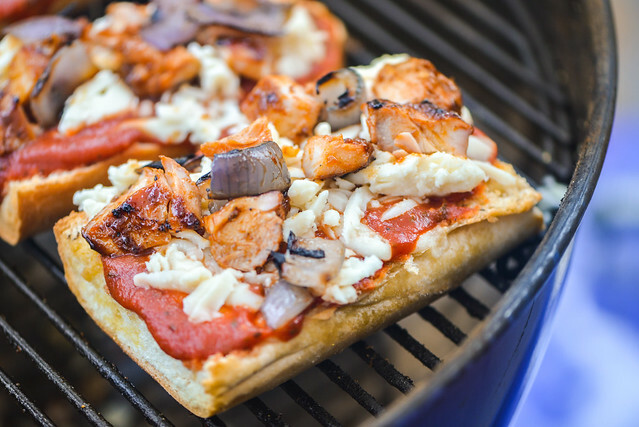 Spread a layer of pizza sauce on top of each piece of bread followed by another layer of mozzarella, barbecue chicken, and chopped onions. Cover grill and continue to cook until cheese has completely melted. Remove pizzas from grill and top with fresh cilantro to taste. Serve immediately.